Anthony Jackson-Hamel scored from close range late into stoppage time to equalize for the Montreal Impact as they twice came from behind to draw Philadelphia Union 2-2 on Wednesday in the Suncoast Invitational. Ilson Jr. opened the scoring for Philadelphia with a dipping 25-yard effort in the 33rd minute against the run of play. Nick DePuy equalized for Montreal in the 68th minute before C.J. Sapong put the Union back in the lead in the 82nd minute. But Anthony Jackson-Hamel slotted in a shot that deflected off Ken Tribbett late into stoppage time as Montreal salvaged the draw. The Union started a strong XI with Derrick Jones finding himself in the first team slotting between Haris Medunjanin and Alejandro Bedoya. Jay Simpson was given the start up top, flanked by Ilson Jr. on the right and Fabian Herbers on the left. Keegan Rosenberry, Oguchi Onyewu, Richie Marquez, and Fabinho were the back four in front of Andre Blake. Montreal was on the front foot from the opening whistle with Laurant Ciman and Ignacio Piatti dictating play for the Impact. Blake was called into action in the 13th minute to deny Piatti’s well struck half volley, flying high to his right to tip the ball away. Chances were few and far between for the Union as they struggled to possess the ball for the opening half hour. Fabian Herbers did very well coming off the left side and shooting with his right foot in the 15th minute. Fabinho was active down the left as well, always available for an overlap. The Union’s farthest forward, Simpson and Bedoya, struggled to find meaningful touches when the ball did come to them. Ilson Jr. opened the scoring the 33rd with a well struck shot from 25 yards against the run of play. The winger picked up the ball in the center of the pitch, made a little space to shoot by moving to his right, and fired a low shot that bounced just in front of Maxime Crépeau, who will be disappointed not to have pushed the shot away from that distance. The goal buoyed the Union who were much more positive after the goal and saw more of the ball, though Blake was forced to bail them out again with a strong save in the 35th minute on Ballou Jean-Yves Tabla. Philadelphia made two changes to start the second half, with John McCarthy coming in for Andre Blake and Roland Alberg replacing Derrick Jones. The Union were brighter in the second half, with Medunjanin quarterbacking many of Philadelphia’s better moves. In the 60th minute, he hooked a good ball down the right into Ilson Jr., who squared for Herbers, who could only fire his shot over the bar from the edge of the area. The Union made wholesale changes in the 63rd minute. Herbers and Alberg were the only field players to stay on as Ray Gaddis, Jack Elliott, Ken Tribbett, Giliano Wijnaldum, Adam Najem, Brian Carroll, Marcus Epps, and C. J. Sapong all came on. Montreal equalized in the 67th minute through DePuy. Jackson-Hamel would make a 25-yard run with the ball into the Union box on the right side and square for DuPuy, who lost Tribbett to slot in easily from seven yards out. Sapong would have a great chance to return the Union the lead in the 70th minute, sliding in just ahead of Alberg but pulling his shot wide as the very active Marcus Epps did well to cross from the right. Philadelphia took a lead in the 82nd minute through Sapong. A short corner kick was worked back to Brian Carroll who lofted a ball to the far post that Tribbett was able to head back across the Montreal goal. The ball drifted just over the head of Epps, but Sapong was just behind him to slide in and head home from his knees. Philadelphia looked to have done enough to secure the win, but Montreal equalized in the second minute of stoppage time. Anthony Wallace brought down a long ball and looked to take Gaddis on one versus one. Gaddis looked to have position himself well and have the inside track as Wallace pushed the ball past him, but he was unable to clear and the Impact trialist squared a pass for Jackson-Hamel. The forward took his shot first time, and it took an awkward deflection off Tribbett before sneaking past John McCarthy at his near post. 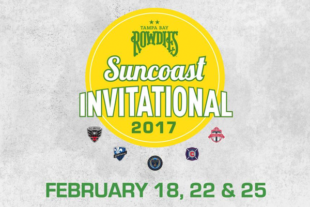 The Union’s final match of the Suncoast Invitation will be against D.C. United on Saturday at 7 pm. Halftime subs: John McCarthy for Andre Blake. Roland Alberg for Derrik Jones. From these past two matches I have one concern that really bothers me and that’s the #10 spot. The Union may have “depth”, but I don’t think they replaced Barnetta. I also don’t believe Bedoya is the answer. I’ve seen nothing that indicates he can power the team’s offense. I don’t think Haris, Ale, and Jones looked all that bad together, there just wasn’t real creativity in offense. I also liked the look of Bedoya next Haris, but Alberg didn’t offer much but some recycling of the play and a couple shots. Meh. There were times in the previous two seasons where Barnetta took the team on his back and seemed to create offense by his sheer will. What it really was, was his skill and inventive genius. That has not been replaced. Until they find some reasonable facsimile there of, I think scoring consistently will be a problem. I am inclined to agree, although I think the team realizes this issue and is not expecting Bedoya to replicate Barnetta’s contributions. I suspect the hope is to generate offense from wide areas and turnovers rather than the central midfield position. Can’t say I disagree and this is the weakest position in MLS if you ask me. It is where the teams should be spending their highest DP slot on. I am hopeful that Bedoya will get better there though. I guess we will see as the year goes on. One can argue the pick up of the CAM single handedly galvanized Sounders. Simpson didn’t seem goal dangerous, but I liked his patience and willingness to keep possession going rather than trying to force things. His hold-up play was solid. Herbers was everywhere on the field, involved in almost everything the Union was doing, and not QUITE good enough anywhere. Still, he does seem improved from last year. Tribbet reminds us of why Curtin plays him–he has undeniable aerial prowess, but continues to be lackluster in most other situations. The last minute is a nice microcosm of so many of my Union nightmares. Final seconds, Ray loses out in what he’s supposed to be best at and Tribbet (doing his job, granted) deflects a ball in that it looks like McCarthy would’ve had covered. I take solace in the fact that no one involved is a starter any longer. Again, the complete lack of ability to possess the ball showed. Blake had to make some great saves to keep the Union in the game. It was also disappointing that there were several times the Montreal keeper bobbled the ball but no one for the Union was hustling to make him pay for it. Frustrating to see how the Union still keep blowing leads. At least this time it was their backup team on at the time. +1. We are developing a pretty nice setup of young players for Bethlehem this year. I’m thinking Fontana, Najem, Jones, Real, Trusty, Epps. Plus the other draft picks and more academy guys. Obviously not all will make it, but odds are a few will. You are discounting facts in evidence. Derrick Jones has started at #8 twice, as a complementary player between Medunjanin and Bedoya. Both times he has improved noticeably in the role as the match progressed. I think Jim Curtin will start him Saturday against DC, and, unless something goes wrong then, will start him against Vancouver. I liked what I saw from Najem for most of the early second half. He seemed so comfortable dropping deep, collecting the ball and playing distributor. Made quick, decisive passes. I agree, I’m worried about Bedoya at the #10 role. He doesn’t look pressing at this point. The union need him to press high and create the attack going forward. I do like that he can defend when needed. Haris looks great. He’s so comfortable on the ball and his passing accuracy is fantastic. It has to be around 90% at least. Derrick Jones and Epp look very promising and need to stay on the first team. We need that winger that has success taking on defenders 1 v1 and Epp looks promising. . I also think Jones could eventually fit in the #10 role if need be. They both need time to get better but it seems they deserve playing time. Illson Jr. can take on defenders 1 on 1. In fact I think he is the only player on the team who I have confidence in doing that. Unless of course by taking on defenders 1 on 1, you mean “knock the ball past them and try to run past them”. Caught most of the game… “with Derrick Jones finding himself in the first team slotting between Haris Medunjanin and Alejandro Bedoya” – was that a slight formation tweak from 4-2-3-1 to 4-3-3 with one CDM? Might not have set the world on fire its first time out, but we did score two and to me, that could help solve our #10 problem – don’t use one! From what we’ve heard Haris is an offensive CM/CDM. Maybe this allows him and Bedoya to drive the team up the field with a pass or dribble, wings cut in and FBs overlapping. Bedoya’s best attribute is his hustle and stamina, his touch and vision are average, so this could get the most out of him and let the ST and wings use their movement to create from the inside while the FB handle crossing. Alberg can start the year as a super-sub, coming in for a wing or to replace the CDM as a second ST when we are down in the second half. Missed the game – had one of my own at the same time – but to hear a possible “slight formation tweak from 4-2-3-1 to 4-3-3” perked up my ears (through my eyes because…internet) because when looking at the roster moves this past offseason, I commented a few times here that I would not be surprised to see that very thing happen. Also, I believe Alberg has experience in a 4-3-3 as both a wide attacker or as the most offensive minded of the midfield 3. I tuned in at about 5 mins, so missed any pregame talk about lineup/formation, but def said to myself hmmmm, Bedoya and Haris both getting forward and tracking back, looks like Jones staying deep in the middle… seems to be confirmed by Mike’s statement. I like it. This small adjustment would allow, for the most part, consistency in style of play through the U and Steel as desired, but get the most out of what the first team has to work with now. If our wings and Alberg are our biggest threats to create/score, but they are light defensively, this lets Ale and Haris compensate for that while still getting involved in the offense. Yeah, looking at the roster you have Edu-Bedoya-Medunjanin once Mo is healthy. That is a very for fordable and balanced group in the center that could allow the wings to play higher. As it turns out, many of the wingers are goal scorers (Pontius, Herbers, Picault) or 1v1 creators (Ilson Jr., Epps) all of whom it would be good to have closer to the final 3rd as much as possible. So even if the Union call it a 4-2-3-1 it may play more like 4-3-3, even just due to the tendencies of the players on the field. I think Derrick Jones is effectively Edu’s place holder. in last night’s match compare Bedoya’s defensive pressing to Alberg’s. Bedoya will be the #10 IMO. It looks like Medunjanin is the #6 and Mo will go back to his roots and be the #8. I didn’t see the game so I don’t know. But does anyone think there is more value in pushing Bedoya to the wing and playing Alberg at the 10. I mean from reading the game recap when Alberg came in it sounded like they had more possession. I still think Bedoya’s best spot is out wide on the right. Medunjanin seems to link with Alberg from the sounds of it and Bedoya provides that extra option of possession on the wing. Granted, I am an Alberg detractor, but I don’t think you can read too much into his presence in this game. When he came in it was with an almost complete line change (Herbers and Jones were the only starters not subbed off), and it was against Montreal’s second team. Too many wholesale changes to judge any one player’s effect on the game with clarity. a gentle respectful corrective tweak,please? Jones came off for Alberg at half time. The mass sub was at the 60th or so minute. You are correct, of course. My apologies. I am getting my preseason game wires crossed. I also am skeptical of Roland Alberg’s place in major league soccer. I’d love it if I were wrong, but I don’t think I am. Alberg came on for Jones at the 46th, and moved Bedoya back to the #8 while occupying the #10. Defensively that was not as effective a pressing combination as had been Bedoya #10, Jones #8 and Medunjanin #6. Offensively, Medunjanin does not yet have the same chemistry with Alberg that he does with Bedoya. Kevin Kinkead has an excellent piece on Philly Voice about the Union having the pieces for a 3-5-2. Interesting thoughts. Respectfully, the facts in evidence say Medunjanin has only played at the #6 for the Union. Secrecy and surprise have tremendous value. the nuances and coordination of familiarity have more on the soccer pitch. Jim Curtin has not practiced a 3-5-2 in any of his game opportunities, including the closed ones of phase two of preseason. Adam Cann’s discussions of a 3-5-2 over the winter and last year when assessing opponents who used it suggest its requirements for its backs and flank midfielders are vastly different from the flat back four. I have my doubts about any such change. oh to be honest, I don’t expect it to happen either, nor do I think it best fits this group, i was simply entertaining the article’s potential 3-5-2 line-ups with current health status. The switch that I do see a possibility in has been mentioned by plenty of other people and that is the single pivot in the 4-3-3. Could be a nice feature when down a goal late. Three other thoughts from the Montreal scrimmage. Jack Elliott failed to shift over to cover Tribbett’s shift to his left leaving a man wide open for a tap in. Ray GAddis gave it away. Tribbett failed to rescue the resulting shot. 2. Montreal sat Dominic Oduro, so we have not seen the number #1 back line against truly elite speed, yet. 3. an offensive tactical theme seems at the moment to be having flank midfielders/wingers who can penetrate the center on the dribble. I thought the starting back line looked good with Gooch there, he looked impressive to me.